Expanded character creation rules allow you to customize your character's background with Edges and Flaws and play ghouls or shapeshiftes. Also includes rules for running, jumping and even being an escape artist! Provides expanded contact rules and introduces Enemies - the evil side of contacts. Plus campaign and scenario creation, prime runners, training rules and security rules for gas traps, trip wires and sensor plates! Play a street gang or a government covert ops team, a DocWagon high-threat response team or even the cops! The Shadowrun Companion offers advanced and alternative rules for players and gamemastes. This indispensable book includes a guide to creating adventures and campaigns, and suggests step-by-step techniques to help gamemasters get the most out of the Shadowrun universe. 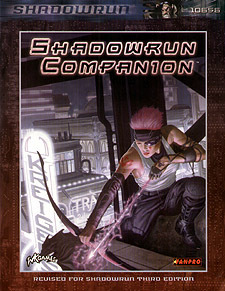 The Shadowrun Companion is revised for use with Shadowrun, Third Edition, and is compatible with all Shadowrun sourcebooks.